First high-resolution image of Mercury transmitted by the MESSENGER spacecraft (in false color, 11 narrow-band color filters). A NASA spacecraft orbiting the planet Mercury will spend an extra year circling the small rocky world, extending its mission to 2013, mission scientists say. NASA's Messenger spacecraft has been orbiting Mercury since March and was slated to end its mission in March 2012. But the new mission extension will allow the spacecraft to continue mapping the closest planet to the sun through at least March 2013. Messenger launched toward Mercury in 2004 and flew by the planet three times before becoming the first spacecraft ever to orbit the small, rocky world on March 17 of this year. "During the extended mission we will spend more time close to the planet than during the primary mission, we'll have a broader range of scientific objectives, and we'll be able to make many more targeted observations with our imaging system and other instruments," said Messenger's principal investigator Sean Solomon, of the Carnegie Institution of Washington, in a Nov. 14 statement. "Messenger will also be able to view the innermost planet as solar activity continues to increase toward the next maximum in the solar cycle. Mercury's responses to the changes in its environment over that period promise to yield new surprises." Messenger, which stands for "Mercury Surface, Space Environment, Geochemistry, and Ranging,"will take aim at several enduring mysteries of Mercury during its extended mission. Those include questions over how long volcanoes were active on Mercury, how changes in the sun's weather cycle affect the planet's ultra-thin atmosphere (called an exosphere), as well as the source of oddly energetic electrons on the planet. "The extended mission guarantees that the best is indeed 'yet to be' on the MESSENGER mission, as this old-world Mercury, seen in a very new light, continues to give up its secrets," said mission project scientist Ralph McNutt of the Johns Hopkins University Applied Physics Laboratory in Laurel, Md., which manages the mission for NASA. To date, Messenger has snapped more than 60,000 photos of Mercury with more images coming in every day, according to its mission website. Artist's impression of the MErcury Surface, Space ENvironment, GEochemistry, and Ranging (MESSENGER) spacecraft in orbit at Mercury. Messenger mission project manager Peter Bedini, also of JHUAPL, told SPACE.com in an email that NASA is currently working out the funding details for the extended mission. 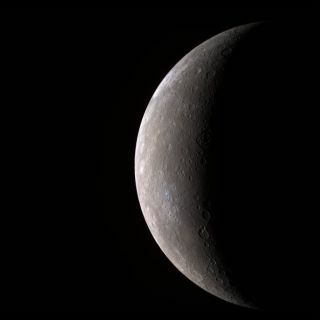 In addition to supporting Messenger's orbital operations at Mercury through 2013, the new extension also will allow mission scientists to continue studying data from the spacecraft through at least 2014. And there is a chance that Messenger may get an even longer stay at Mercury. "Regarding operating the spacecraft beyond March 2013, it is expected that spacecraft resources will be available to do so, but that scenario has not yet been explored," Bedini said.